Each frame is .1 second apart. This is Misty Hyman's first stroke after completing her controversial underwater stroke after the last turn in the 200 m event. Frame #1: The legs kick to counter-balance the entering arms' vertical force component. What is noticeable about the kick is that the legs do not "go up and down." They start wide with the feet inverted and kick in a shallow arc. This probably has some advantages over a purely vertical movement in that force is applied with a greater surface (shanks and feet) over a greater distance resulting in a greater terminal force. The kick is with the lower leg as there is considerable bend at the knees. The hands enter at shoulder width. Frame #2: The kick continues along the arcing path. The arms have straightened and are wider than at the initial entry. The head is perhaps buried unnecessarily too deep. Frame #3: The kick is completed and the hips have risen and the shoulders dropped as a reaction. A smaller kick would have produced less reactive force in the shoulders and helped maintain better streamline. The head begins to rise to counter-balance the dive of the shoulders. The arms start to bend at the elbow and the upper arms begin to medially rotate. A noteworthy feature of the arm pull is that the hands are visible and beginning to apply force. This is a movement similar to that displayed by Mary T. Meagher. There is very little lost time in developing force with the arms. Frame #4: As the head continues to rise the hips and feet begin to "flatten" assisting streamline. The arms continue to bend and develop force although a considerable proportion involves the vertical component. Frame #5: Body and legs streamline is achieved. The shoulders have risen as a result of a largely downward force created by the movements of the arms. If the shoulders had not originally been buried then at this stage arm force could be more productivley propulsive. However, there would still have to be a vertical force component in the arm movement because the head has to emerge to breathe. Frame #6: The elbows bend rapidly as the upper arms adduct. This movement creates both propulsive and head-lifting forces. The head begins to emerge above the surface. Frame #7: The head and shoulders rise to facilitate breathing causing the hips to drop. As the hips are lowered the knees bend preparatory to kicking and the hip joint is hyper-extended to keep the thighs relatively flat (streamlined). The arm action uses the hand/forearm surfaces for propulsion the force being generated by adduction of the upper arms. Frame #8: Propulsion through the arms is completed and the arms begin extraction. To counter-balance the vertical forces created by the arm movements a second kick begins. Frame #9: The hands are ready to exit and the "arcing" kick is demonstrated. 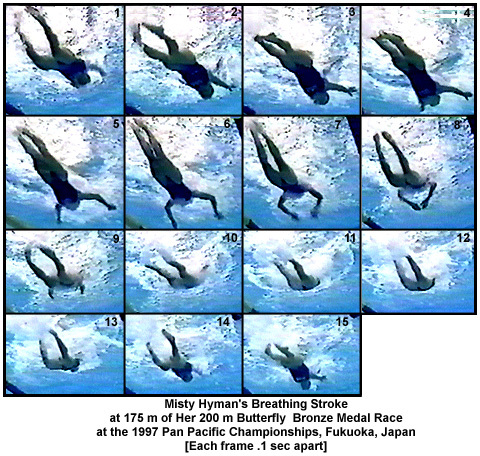 Frames #10-#13: This sequence shows how long the shoulders and head are maintained out of the water along with the recovering arms. These actions and their duration should be minimized as much as possible because they are extremely fatiguing. Frames #14-#15: Positions similar to those displayed in frames #1 and #2 are repeated. Misty Hyman's stroke exhibits a common fault in female butterfliers, exaggerated body movements and excessive kicking. Those actions require counter-balancing movements that do not contribute to propulsion, disrupt streamline, and consume energy. However, a distinctive good feature of her stroke is the almost immediate development of force with the hands after entry. There is no "lag" time due to unnecessary movements as occurs with Susan O'Neill's arm entry. Of the "modern" female butterfliers Misty Hyman exhibits perhaps the stroke that comes closest to that of Mary T. Meagher. With better race pacing and the new underwater stroke limitations that will restrict her exhausting and questionable "breakout" underwater kick that she has used in the past Misty Hyman may well become the top swimmer of this stroke in coming seasons.